Exploring Proteins offers a complete course in developing the skills - and self-confidence - to be able to understand the way proteins behave and the basis of the methods used to separate, identify and characterise them. Finding out about biological molecules and systems is a hands-on, experimental task: Exploring Proteins equips the reader with the skills they need to plan and carry out this experimental work, and to understand, analyse, and present the data their work generates. 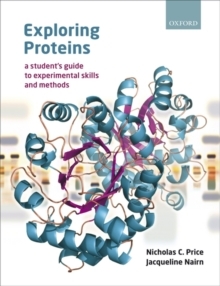 With a focus throughout on active learning, the book blends background information on proteins and protein biochemistry, with the methods used to study them, featuring extensive worked examples and questions throughout to help the reader check their understanding, and develop critical data-handling skills for themselves. It also offers complete flexibility - with sample data sets for readers without access to a lab, and suggested protocols for use where students can be given the opportunity to collect data for themselves. With the emphasis of research shifting from genomics to proteomics, there has never been a more important time for students to master key biomolecular research skills. Exploring Proteins is the ideal companion and guide to ensure students develop the skills they need.